Over the course of life you make experiences, learn from them and have certain key “nuggets” of wisdom that you hold on to. These are rules that you found that make you more successful and happy, make you avoid stupid things and make better choices. What are those? Rules are magnets for cognitive dissonance. More than any generation in history we’re awash in lists of rules: the 7 secrets of this, the 12 killer tips for that. These lists have the pretense of providing insider advice for living better lives. But I can’t say the abundance of rules has made much of a difference for our quality of life. Are we better people than we were 50, 100 or 500 years ago because of these lists? Take the Ten Commandments: it’s the most well known list of rules in the world, and the most frequently ignored, even by those most faithful to them. I’m afraid of rules for that reason. It’s easy to find rules that are satisfying to mention, even when we delude ourselves that knowing a rule equates to following it. I’m doubtful that rules for one person are useful to others. When I played for my high school basketball team, I used to write “Play Smart” on the top of my sneakers. I was prone to turnovers and it was my little way of reminding myself to calm down. Had I copied Michael Jordan’s rules for himself or Magic Johnson’s, it couldn’t possibly be aimed at what my real problems were at the time. It’s useful to learn from masters, but the copying and pasting of one amazingly talented person’s system for their work to a novice or beginner is just silly. Rules and advice are a place to start, but anyone who does the work of trying to apply any sets of rules to their daily lives soon customize them, and it’s the work and self awareness that’s the hard part, not the rules themselves. Instead there are pairs of contradicting rules I think about often. Each side of each pair are true, but never to the exclusion of the other. The uncertainty generated by these “rules” keeps them alive and pushes me to revise and review the rules themselves. The Golden Rule vs. Capitalism. One of the greatest contradictions in America is our hypocritical notions of biblical and economic ethics. We believe in the golden rule, and treating others as we believe they want to be treated, but this is in direct contradiction to competition, a central element of capitalism. In effect every NFL or NBA game consists of thousands of people intentionally not practicing the golden rule (“I want you to lose and will rub it in when you do”). Life itself is based on both cooperation and competition, not one at the exclusion of the other (see Dark Nature: a natural history of evil for an excellent primer on the moral duality of life). I try to treat everyone as I think they want to be treated, but I know that to run a business or to treat myself with self-respect, I sometimes have to put myself first (which can be done with varying degrees of grace). I often think about the idea of selling out as a writer, and what integrity means for someone who sells ideas for a living (See How To Call BS on A Guru). Live for the future / Live for the moment. The philosophy joke at work here is “everything in moderation, including moderation.” Living a balanced life means sometimes going too far, and sometimes not going far enough. It’s only when you hit an extreme that you rediscover where the middle ground for your life should be. I love being disciplined, and I love being a hedonist and I know there is a place and time for each attitude. I believe in taking big risks, but I don’t see any reason not to think them through. I know I become more ambitious if I know what my safety net is, not less. When I decided to quit to become a writer, I planned it carefully. I know some people lose their nerve when they consider all of the ways they might fail, but I don’t. I gain confidence from it. Generally I want to be wiser in the future which demands working on the edge of my comfort zone, sacrificing “the now” to get more data, which improves my judgment in whatever I’ll be doing a decade from now. Make meaning, but accept meaninglessness. I believe the universe is unknowable and most likely has little to do with the human race. I don’t believe in god, gods or the supernatural. I think the most likely outcome is the human race dies with the sun in a few billion years. This sounds horribly depressing, but I find it liberating. I know how special conscious life is and I LOVE being alive. It’s all the more amazing when I consider the infinite wonder around me might never happen again: this could be a once in a universe experience. This also means it’s up to me to decide to care about the Golden Rule, or not, or about my dog Griz, or not, or my friends and family, or not. I alone have to chose to put my limited energy into making those relationship meaningful (or not). It’s up to me to make the feelings and ideas I care about important in my life and no one else can do this for me (e.g. existentialism). I have to decide what matters and how much of my life energy I’m willing to dedicate to that decision. The very nature of the universe is a cry to anyone paying attention that we must decide what matters and aim the full force of our lifespans at that meaning while we are here. Or concede we don’t care as much as we pretend we do, when there’s so much good TV to watch. If there is meaning, it’s up to us. Everything is funny / Everything is serious. Every time you hear a joke that makes you laugh you have to know there’s someone out there who was offended or hurt by the joke. But we forget this when a joke hits too close to our lives, and that’s part of the rub of human nature. We’re emotional creatures who love to pretend we’re rational. My wife Jill is my best friend and central to our marriage is our deep, dark, twisted sense of humor. We eventually find a way to laugh at everything, even ourselves in our worst and saddest moments. I can’t take anything too seriously for too long and it’s a sign of my closest friends that they help me laugh at myself, at the universe or at the idea of life at all. Voltaire wrote “God is a comedian playing to an audience too afraid to laugh” and I if I believed in God this is the kind I’d agree with. Things in life can be sad and funny at the same time, one does not preclude the other. I do take work seriously. I work very hard at everything I do. I’m extremely serious about the things I make. But I can’t let myself lose sight of how funny it all is, even my belief that my hard work, in the end, matters, which it probably doesn’t. Far greater writers and artists than me have long been forgotten to history. But if I believe in the kind of meaning I’ve chosen, I’m committed to doing the work anyway, almost inspired by the fact I can’t know what meaning it will have in the future, if any at all. Feelings and Reasons. There is no such thing as a purely rational moment. The oldest parts of our brains control our emotions and drive our immediate responses to life (Read about your friend the amygdala). I used to pride myself on being logical, but as I studied the human mind, and myself, I discovered logic is a great disguise for emotions. We hide meanness and judgement behind “logic”. We often confuse debating skills and charisma with the hard work of truly thinking through both sides of an argument. Sometimes I have to let my emotions lead, and stop to ask myself: “What am I feeling right now? Why am I so angry about this Facebook comment? What feelings am I carrying around that are surfacing now?” And sort those feelings out before engaging with the world. Other times I have to let my logic lead, and focus on finishing the workout despite the pain, or writing the draft with complete disregard for my fear or self-loathing. Many of us live in denial of our emotions, pretending throughout our lives that we don’t feel the way we do, never understanding ourselves, and therefore never understanding anyone else. But we need a balance of logic and emotion to be the best version of ourselves. What are your rules to live by? How did you decide on them? Leave a comment. Scott December 16, 2014 at 12:03 pm. Permalink. It’s also fun to consider these are the rules *I think* I live by. We’d really have to ask the people who I live and work with how well this or any list maps to my actual behavior. Claude Emond January 9, 2015 at 6:51 pm. Permalink. • I believe that every human being is a miracle of life and has unlimited value. • I believe that we are all equals. • I believe that every person tries his or her best and has a positive intention. • I believe we were born to be happy and that the projects we do together can and must make us happier. • I believe that everyone manages projects from birth and, intuitively, knows how. • I believe that no one is truly alone, and that others care about each of us. • I believe that together we are stronger than alone. • I believe that we have the capacity, both as individuals and collectively, to make a success of any project we choose. • I believe that we are all co-leaders, co-sponsors and co-creators of the projects we do together. • I believe that through our projects, we can change the world to be a better place for all. • I believe in YOU, I believe in ME, I believe in WE. Scott January 9, 2015 at 7:04 pm. Permalink. Maximilian December 16, 2014 at 2:37 pm. Permalink. I like your thought of being sceptical of rules. I realize more and more that most rules I create for myself are not as useful as I think. 1. Keep most things as simple and as reduced to a minimum as possible. Even your problems. Related to that: Start fresh everywhile, when you think it gets too complex (e.g. my life philosophy). 2. Do less things more intensely: My mind wants to learn everything, but I always ask myself: What do I really enjoy and need at the moment? 3. Courage to be incompetent: (to be a fool) It helps me to explore myself and my irrational behaviors and start new things asap. 4. Reality test: Test, whether your perceived quality ideas and thoughts of other persons feelings are real. Does it lead to the results I anticipated? Do I have success in that hobby as I wished (=strength or weakness)? Is she as angry as I think she is? Scott December 16, 2014 at 4:24 pm. Permalink. I definitely love the goal of simplicity. It’s fun though to talk to different people about what this means and how they put it into practice and suddenly simplicity becomes complex! The others you listed are good. Thanks for asking and commenting! J Wynia December 16, 2014 at 3:40 pm. Permalink. I really like the use of pairs of “rules”. I’ve long loved the quote from Niels Bohr: “the opposite of a great truth is also true”. For the things worth pondering in life there are, at a minimum, 2 entirely valid lenses through which the situation can be viewed and considered. That gives one the glass half empty and the glass half full viewpoints, but I always also look for the others: the glass is too big. By the time you’ve viewed the situation through the various lenses, there’s usually a balanced decision in there somewhere. If it’s still a toss-up, I go with the one that does the least harm, causes others and myself to be happy or causes me the least headaches. Scott December 16, 2014 at 4:46 pm. Permalink. I love that Bohr quote. Not sure it’s always true, but it’s always wise to look for it. Same for arguing one side of an argument – just because you have a good point doesn’t mean there aren’t equally good points for the other side. I love “The glass is too big” – how true. Why is it we try so hard to make the glass small? I guess that’s part of my gripe about “rules for life” – reduction and concision are important but it’s so easy to get false confidence when you’ve worked things down to a nice pithy quote. J Wynia December 16, 2014 at 5:13 pm. Permalink. Not to get too philosophical, but for Bohr’s quote to be true, it must sometimes not be true. If, after all, his statement is itself a great truth, it’s opposite is also true: that some great truths stand on their own. However, if you believe great truths to be unopposed, you’re unlikely to keep looking once you find one. Evan January 7, 2015 at 1:57 pm. Permalink. I find the fact that the Bohr quote may not always true increases its value, rather than decreasing it, because it forces us to ask the question and examine the answer. And I suspect that Bohr himself recognized that it may not always be true, and may have had the courage to give its value to the world despite the risk of suffering the accusation of being incorrect. As J Wynia elaborated, the quote itself seems to implicitly acknowledge this. Nancy December 16, 2014 at 6:25 pm. Permalink. Thanks for the great post, Scott. In the first, practice has two meanings – acting in kindness towards others; and practicing that daily, since I often fall short of the ideal. The second on its face can seem hedonistic if I apply my Catholic upbringing to it, but it is rooted in living a conscious life. I, too, LOVE being alive and I work daily on acknowledging the joy inherent in just living. Hope the new project is going well. Scott December 17, 2014 at 6:39 am. Permalink. Thanks Nancy. You make a good point that all list of rules should have a last rule about practicing all of the rules regularly. That’s a nod towards my complaint about cognitive dissonance. Larry December 17, 2014 at 7:09 am. Permalink. I believe in God — a God who’s far more fascinating and far more wonderful than most religions give him credit for being. This God has put us into a universe that’s amazing and complicated, and he’s given us the opportunity (some might say the duty) to find our way in it. This God cares for people above all else, which tells me that I ought to care for people too. This God is incredibly creative, and he has a great sense of humor. Voltaire had it right, and so do you: everything is funny, everything is serious. Finally, like you, this God believes in balance: Ecclesiastes 3:1-8 (a time to be born and a time to die, etc.) is for me one of the “truest” passages in the Bible. Mike Nitabach December 17, 2014 at 7:48 am. Permalink. Scott December 17, 2014 at 12:23 pm. Permalink. 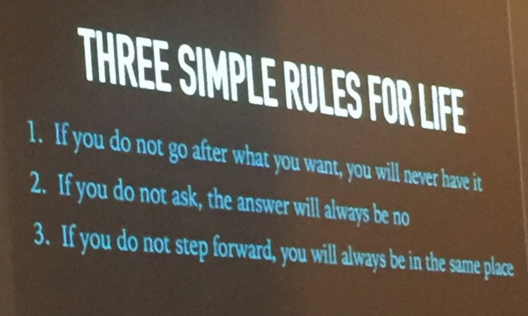 I dig this – it’s related to the golden rule. The rub for me is the knowledge that sometimes people only pay attention or learn something when they, in the short term, feel worse, at least in some dimension. There are more and less graceful ways to handle this, but sometimes people need to feel something hard/sad/bad. Mike Nitabach December 19, 2014 at 9:00 am. Permalink. Steve December 17, 2014 at 11:22 am. Permalink. The one rule I have and most successfully live by is to do what I said I’ll do. A promise made is a promise kept. It makes you more careful about what you say and I think others appreciate that I will do my best not to let them down. I also expect others to live by the same rule. That results in my disappointment too often, but what are you going to do? Scott December 17, 2014 at 12:21 pm. Permalink. I like that rule and it’s the basis for how we generally evaluate who we trust and who we don’t. The rub is a rule like that needs a counter-rule for changing your mind. Maybe you learn something after you make a promise that makes fulfilling the promise a bad idea for everyone involved. What’s the right behavior then? Evan January 7, 2015 at 2:05 pm. Permalink. Biblical advice I appreciate, which is translated variously and I quote inexactly: “Say ‘yes, yes’ or ‘no, no.” Don’t vacillate, don’t hedge. Make up your mind, make a clear decision for yourself, and communicate it quickly and promptly. Then follow through. Nancy December 17, 2014 at 3:58 pm. Permalink. Your post really touched me – because it is something that I also dealt with for a very long time. Today, when I feel an expectation coming on, I make a conscious decision to stop it in its tracks. I do not expect others to live by my rules, but I can choose to surround myself with people who share my values. Someone (ok, my therapist) said “sometimes your friends/family let you down, don’t they?” Yes, they do. If someone however, continually acts in ways contrary to my values, I have choices in how I handle that. I don’t expect them to change. Scott December 18, 2014 at 9:47 am. Permalink. I like to think that people I’m close with want to know when I feel they’ve let me down, and want to sort out what happened. Maybe they don’t know the rule I have in my mind? Or maybe I’ve misinterpreted their behavior? There’s only one way to sort it out and the desire to do that hard work is perhaps what makes relationships last. Jeffrey Cufaude December 17, 2014 at 2:49 pm. Permalink. Like you, I’m not a fan of rules, but I do turn a few principles for guidance, each one modeled by someone I respect and admire. I won’t trouble you with the narrative behind each, but instead just offer the basics. 1. In your work, try to model beliefs and behaviors that would make the profession better if adopted by everyone. In short, be the standard-bearer. 2. Everyone holds a piece of the truth. Seek others’ truths with respect and genuine curiosity and you just may get enough pieces to make sense of things. 3. Too much of a good thing is still too much: Say Yes Less (working on a manuscript about this right now). 4. Whenever you have a seat at the table, use it to build bigger tables and offer seats (including yours) to others whose contributions are most needed. 5. Do amazing work, but don’t charge amazing fees for it … even if you could quite easily. Scott December 17, 2014 at 3:11 pm. Permalink. I like #2 – it certainly helps to start by acknowledging everyone has their own sense of the truth, even if it differs from mine. Chris December 17, 2014 at 3:58 pm. Permalink. I’ve been trying to implement these rules from Jim Rohn: “Don’t wish it was easier, wish you were better. Don’t wish for less problems, wish for more skills. Don’t wish for less challenge, wish for more wisdom.” In each case, the first option leads to self-pity and a self-defeating sense of entitlement, while the second option leads to creativity and the potential for personal growth. Also, for me, the golden rule isn’t contradictory to capitalism or competition. Certainly, people often behave poorly in many (all?) areas of life, including both business and sports. But maybe that’s a flaw in character or practice instead of a contradiction inherent in the ideas themselves. In business, the golden rule can be exercised by refusing to slander your competitors or misrepresent them in advertising. Similarly in sports, the golden rule can be applied by conducting oneself with good sportsmanship. At first glance, it might appear that the golden rule dictates we just let our opponent win on the football field; on the contrary, doing one’s best to win according to the rules of the game is a more fitting application of the golden rule here, as it demonstrates respect for both one’s opponent and the activity of competition itself. Scott December 17, 2014 at 4:15 pm. Permalink. I totally agree with your point about the golden rule applied to sports. There is a way to apply the basic idea differently depending on the context, but that’s also the rub of any rule – we can so easily explain and deny away the hard parts of the rules we want to follow. Jean-Victor Côté January 8, 2015 at 7:16 am. Permalink. Heather January 8, 2015 at 9:29 am. Permalink. 1. Always go to the funeral. #1 is about letting people know they and their loved one matter and made an impact on me or my family. #2 is paying it forward and choosing to act from kindness vs all the other emotional options we have. Rory Thelen January 14, 2015 at 1:10 pm. Permalink. 1. I always try to do the right thing! 2. I do the best that I can without accepting mediocrity! 3. I treat others the same way I would want to be treated under the same or similar circumstances. 4. I look for the best in everyone, but am prepared for the worst. 5. I try to leave others feeling better than I found them at their worst. Scott January 14, 2015 at 1:16 pm. Permalink. Thanks Rory. Can you tell me more about how you know what the right thing is? Scott Berkun December 5, 2015 at 3:40 pm. Permalink.